In the spirit of all our departed Brothers, both in the band and in the department, we will continue to dedicate ourselves and our music to them by proudly playing and marching to American, Irish and Scottish tunes and representing our Society and the FDNY. 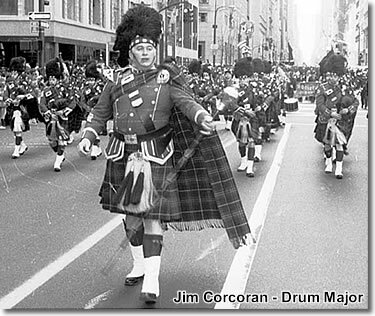 On May 11, 2007 the FDNY "Emerald Society" Pipes & Drums celebrated its 45th Anniversary, with over 800 people in attendance to commemorate this milestone. What started as an organization of 17 in January of 1962, today stands strong at over 100 members, three of whom are charter members; roughly 25 members are a part of the prestigious competition band. Within the band is a competition band competing mainly in the eastern United States and periodically abroad. "The Skirl" of the bagpipes sends shivers of pride throughout my body," remarked one candidate as the newly established "Emerald Society" Pipes & Drums set to work in early 1962. While continuing to practice on their Sinclair wooden chanters and drum pads, the members continued to raise funds through raffles, booster sheets and dances. Bagpipes, paid for by individual members, were ordered directly from Scotland while the Carlton drums, paid for by the treasury, were ordered in the City. After just eleven months of practices, once a week, the band made their first appearance at the 7th Annual Emerald Society Dance in November at the City Center Ballroom, West 56th St., NYC with twelve bagpipers, three snares, one tenor, and one bass drummer. The band continued to make appearances at promotional parties, non-fire department events, marching engagements — then their first Line of Duty funeral on January 24, 1972, for Lieutenant Joseph P. Connelly. This would be the beginning of a solemn, yet cherished tradition. The band is perhaps best known throughout the world for service to their fallen brothers after the September 11, 2001 attacks on the World Trade Center, playing at over 450 funerals in a two-year time period. Ironically, since 1976, the patch worn on the left shoulder of all outer garments of the pipe band uniform features the NYC skyline with the twin towers prominently displayed. the All Ireland Competition, the first American band to ever place in the top 4 at this competition in its 65 plus year history. In the spirit of all our departed Brothers, both in the band and in the department, we will continue to dedicate ourselves and our music to them by proudly playing and marching to American, Irish and Scottish tunes and representing our Society and the FDNY. We are proud of our Irish Heritage, proud to be Americans, and proud to be members of The New York City Fire Department. As present members of the band, we will carry on the tradition into the future, praying and hoping that our future Emeralds will carry on what was started by the Charter Members of 1962.